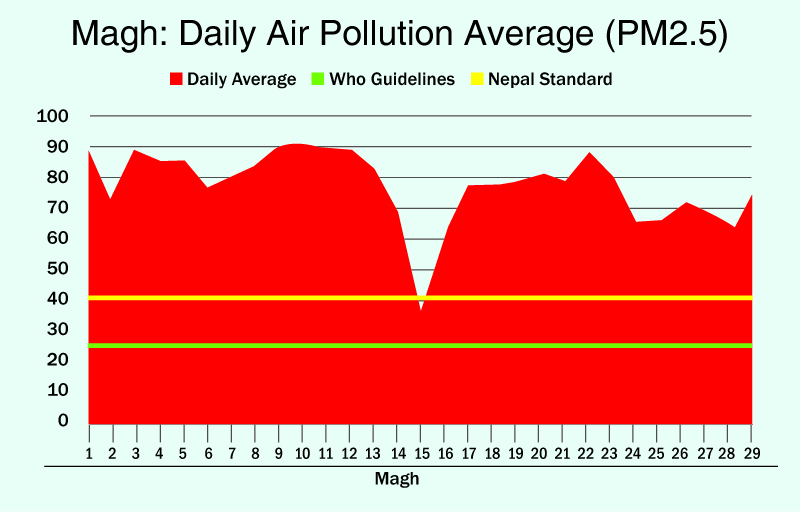 KATHMANDU, March 9: Air quality in Kathmandu was very bad in the month of Magh. It had the highest levels of pollution since Drishti Kathmandu started collecting data on concentrations of fine particulate matter that is smaller than 2.5 microns (PM 2.5) eight months ago. The monthly average concentration for Magh was 79 µg/m³ which is double of Nepal Government’s Standard of 40 µg/m³ and more than three times the World Health Organization’s (WHO) daily guidelines of 25 µg/m³. Standard was on Saturday, Magh 15. It rained in Kathmandu on Friday and the rain helped clear the air of the PM2.5 pollutants. Whereas average PM concentrations were as high as 185 µg/m³ between 9 am to 10 am Friday morning, the rain in the evening caused it to drop to 22 µg/m³ between 9 pm to 10 pm. Other than that day, PM2.5 concentrations far exceeded Nepal’s Standard for the month of Magh. But citizens have no choice. No human should be breathing such low quality air but do we really have a choice? We are all forced to breathe this air. It is like being in a prison room full of smoke and no windows. All of us were forced to breathe this smoky air every day and night in the month of Magh. At least cigarette smokers choose to smoke and harm their bodies. The rest of us are forced to harm our bodies without choosing to. We had no other option but to breathe the filthy air in Kathmandu. Such exposure to PM2.5 levels are extremely dangerous to all citizens living in the Valley. Unlike larger dust particles, the PM2.5 particles are too small for our nose hair and our saliva in our throat to block it entering our lungs. It can go deep into our lungs and from there into our blood. Long-term exposure to these particles may cause asthma, chronic bronchitis and heart diseases. It is even more dangerous to infants and senior citizens already facing pulmonary and cardiovascular problems. When will we be able to breathe fresh air? The Government already knows the sources of air pollution. A high-level committee headed by a National Planning Commission member with the involvement of all the necessary stakeholders submitted an action plan to the government on Magh 25, 2073. So, the government also knows what needs to be done to improve air quality. A month has since passed. What has been done? Why aren’t the prime minister, the environment minister and the health minister actively pursuing the implementation of the suggested reforms? When are we going to see some action? How is the government going to ensure that next Magh will be better than this Magh? Let’s start here. Proper use of Pollution Tax – The government has been collecting 50 paisa per liter of petroleum products since 2064-65. Billions of rupees are lying in the government vaults because the Environment Ministry along with the Department of Environment has not developed regulations on how and what to use that money on. Why? Are they waiting for the air quality to get worse? Green Sticker system – Everyone knows that this is an ineffective and useless system. The environment minister openly admits that you can buy green stickers for Rs 200. Has a red sticker ever been issued? Why can’t we have a proper monitoring system? How about introducing effective green stickers for motorbikes as well. How about having government officials/pollution police stop vehicles on the road and measure the level of pollution coming out of tail pipes of vehicles (as with MaPaSe)? Polluting vehicles need to be fined. There is a lot that can be done. It requires willingness and commitment from our political as well as bureaucratic leadership.